This episode starts the new year with some of the ways NSPE is fighting attacks on licensure, an interview with this year’s Federal Engineer of the Year Award keynote speaker Emilee Blount on licensure and work in the federal government, and a wrap-up of some of the most important innovations of 2017. Read the “A Rising Threat Level” article featured in the January/February 2018 issue of PE. Listen to the Licensure Under Attack webinar to gain insight about the national effort to undermine licensure on a state-by-state basis. 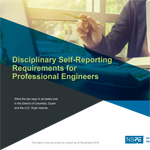 Learn more about NSPE’s work on licensure of federal engineers. Access NSPE’s Position Statement No. 1767 on Licensure of Federal Engineers. Visit the Federal Engineer of the Year Award page to learn more about the award and Emilee Blount, P.E., and to purchase a ticket to the February 23, 2018 ceremony. Access the new slate of 15 free PDH courses offered this year as part of your membership. Get more details and information on our upcoming Engineering & Science Career Network Online Career Fair – a virtual career fair happening on March 21, 2018. This year’s National Engineers Week theme is “Inspiring Wonder” – find out about events and activities planned. Learn more about NSPE’s activities and successes in 2017 with our “Year in Review” website and video. Listen to the podcast team discuss Popular Science’s list of 2017’s 11 most important innovations in engineering from the Best of What’s New list. PE magazine covered biomimicry in a May 2007 feature article.